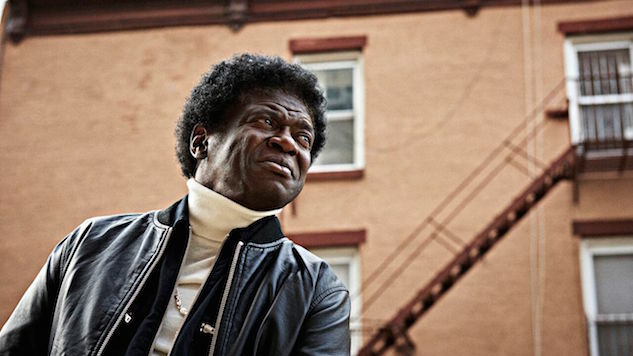 Charles Bradley may be the sharpest dressed man in show business. He greets me at the Thistle Newbury Hotel in downtown London wearing designer jeans, a shiny longhorn belt buckle as big as a black cab, and a crisp denim jacket covering a tailored shirt. Capped by his signature afro, the outfit is both retro and modern at the same time, and he wears it so well, so naturally, that it doesn’t even look like an outfit. It is something more akin to the uniform of a professional entertainer, a man who once made his living imitating the Hardest Working Man in Show Business and now makes his living vying for the title himself. This afternoon Bradley adds a tired countenance to the ensemble. He looks a bit weary, sipping an herbal tea from the coffeeshop next door. He has just come from an appearance at the BBC and a soundcheck at the O2 Forum in Kentish Town, where he’s playing a show in just a few hours. He has been traveling nonstop for weeks, and from London will be off to Paris. It’s a tough schedule for anybody at any age, but Bradley isn’t complaining. He likes to be on the move, loves to meet new people, feels a personal responsibility to give it his all onstage. But there’s another reason for that look of woe on his face, something more powerful and troubling. Bearing down on him is the sad state of the world: hatred and violence overtaking America, fomented by politicians both real and pretend, prejudice and racism given license in the press. It might seem like that soul might be the last thing to speak so directly to those issues, as in the 21st century the term is almost always appended with the word “revival,” as though the music died out or might dwell only in the past. For some artists, of course, soul is a matter of re-creation rather than innovation, but Bradley dresses a different part. On his new album, Changes, he makes old soul music sound unbelievably of its moment. Songs like “Change for the World,” the title track (an impossibly powerful cover of the Black Sabbath ballad), and even the short snippet of “God Bless America” (which somehow bypasses by irony and bitterness to sound impossibly celebratory) sound incredibly relevant to America in 2016, not just in their lyrics but in their sounds. The horns punch you in the gut, the guitars crackle fiercely, the drums bang and pow like fireworks. Everything sounds familiar, yet newly urgent. Bradley presides over every song—from the travelogue “Good to Be Back Home” to the conspiratorial “You Think I Don’t Know (But I Know)”—with power, authority, maybe even something like grace. Popularly known as the Screaming Eagle of Soul, he’s a singer in the gritty style of Otis Redding or Bobby Womack, a man who can inflect a simple “whoooo!” with enough nuance and determination to make it speak volumes. Most of all, he conveys immense compassion, not only for his fellow man but for his country. At a time when politics seems to inspire more dread and bitterness than hope or pride, Bradley’s message of love and peace sounds like a powerful reminder of what makes America great, delivered by a man who struggled all of his life, who lived through segregation and homelessness, who was “discovered” at a point in life when most artists are wrapping up careers instead of launching them, and who has emerged as the greatest soul singer of the decade. That’s a lot for any album in any genre, but Bradley wears that mantle well enough that he serves as an ambassador for the United States. “That’s why I always try to sing from my heart,” he says. “There’s a lot of different souls out here, and a lot of them are going through different changes in their lives. If you sing a song from your soul, then they can hear you and interpret what they hear to their own experiences and what they’re going through.” In other words, soul music is a means of connecting with the world, one listener at a time. Paste : Tell me about the opening track, a gospel version of “God Bless America.” Why did you want to start the album out that way? Charles Bradley: You know, I saw a lot of things back in the days of segregation, and I’m looking at America now and it’s more based on all nationalities. America is starting to be all nationalities, not just whites and blacks, slavery and all that stuff. Everybody is moving to American from all nations, and I like that. Because that will make America stand for justice for all. But some people see all these different cultures coming to America and they don’t like it. It hurts me, the things Trump is saying. He really is to me down-lowing America. Having millions of dollars doesn’t give you permission to run and around and hurt people. We’re all living on this globe together. We’ve got to find a peaceful way to solve problems, but instead people are talking about building a wall in Mexico. I think that’s ridiculous. I’ve been traveling, and I’ve seen the Berlin Wall. I’ve seen with my own eyes these things that happen. They had that wall going through the middle of the city. We don’t need no more of that. We need peace, we need understanding, and we need to let all nations come together. And that’s why I sang “God Bless America,” because of that hurt and pain that I’ve been through in America. My mother used to say, “How do you love God when you’ve never seen him before? Well, you love all of his creations.” That’s what she told me. And it’s been my mission to keep going when somebody knocks me down. I might get hurt, but I get up and go again and forgive them. It’s hard to forgive, but I had to learn. If I hadn’t, I wouldn’t be sitting here talking to you right now. Paste : That seems like a powerful lesson, to answer ugliness with something like love. The rest of it I had to keep going through, but that verse was just like a block that fell into my brain. Now when I sing that song, I think, “Mom, I know you’re in heaven. This is to you. I will sing it to the world from the depths of my soul.” My education is not great, but sometimes a person says something that’s exactly what I’m feeling in my heart. Paste : I think that’s why people keep listening to music. They’re looking for that sense that somebody is feeling what they are feeling. Bradley: That’s why I do a concert, I always try to find reasons to go out into the audience. God, man. Some of the things those people have said to me…I met a guy about four shows ago. This guy was really crying. I said, “What’s up?” “Charles, my brother got killed yesterday.” And man, [he pauses for a long time] I just grabbed him and cried with him. I felt his pain. He said, “Something sent me here tonight, Charles.” I just grabbed him. He was about 22 or 23, but that man was really crying so hard. I felt it. I just cried with him. Everybody was saying, “Charles, you gotta get up on stage.” And I said, “Give me one minute. Leave us alone.” I stayed with him. Since I’ve been doing my originals, it feels like good things have been coming out of me. “Wow, I said that? How do these things come out of me?” You have to let things in your heart come out, so people can feel it. Paste : Do you think you could have had this connection with your fans if you had found this kind of success when you were younger? Bradley: My mom always said I was a compassionate person. She had five boys. I’m the youngest. She said, “I always worried about you, son, ‘cause you’re too sensitive.” Even growing up, anything that I would do, if I can’t put my love into it, I don’t do it. And that’s why people in the neighborhood tried to get into my world and find out where I’m at. But I’m not looking for vicious words. I’m looking for peace, a way to solve things. I’ve always been that way. When I was homeless, I didn’t really stay with a crowd that was sleeping this way. I always strayed away by myself. I always tried to find a little hedge in the bushes that nobody knew about, go to sleep, get up and go again. I always put up in abandoned buildings where there wasn’t anybody else but me. I’d get in there and go to sleep. Then get up and go. Get on a subway train. I’d go in the bathroom, wash up, change my clothes, get up and go again. One time, on this cold winter night, I knew this one building had these big boilers in the basement. It was so cold, so I went down and waited till somebody pushed the buzzer and then I sneaked in and went into the basement. I crawled back by the side of the boiler to keep warm. I knew this man had this German Shepherd down there, and that dog tried to get me, so I crawled back where nobody could see me. This man was wondering why his dog kept barking. He saw me and said, “What are you doing?” “I’m trying to get warm. I’m not trying to cause no trouble.” He called his dog off and said, “I’ll give you five minutes to get out of here.” I grabbed up my stuff and ran. My favorite place was the #7 train, finding the heat that comes out from under the thing, stand there in that one spot and get warm. But then the policeman comes by with the nightstick. Bam bam. You can’t sleep here. So I get up, go across to the next train. But then I joined the Job Corps. The Job Corps actually saved my life. Back in that time, I was hanging out with everybody that was shooting up, snorting up. I’ve always been afraid of needles, and I didn’t want that stuff going up my nose. So I never tried it. I went into Job Corps and they gave me a chance to get myself on my feet. Paste : And now you’re traveling the world and playing to thousands of people every night. Bradley: There’s something about traveling that really opens my spirit up even more. Even at my late age I really started meeting new people, and when I go home, I’m looking at the people at home and they envy me. And I’m saying, “Why you envy me? I went out in this world, hitchhiked all over the country, and you guys wanted to take what I got.” So I really think it’s really getting close to my time in life to get out of that corruption and go with peaceful people who want to live and let live and learn about the truth. I want to see how real people can come together and try to make this world a better place. That’s why I tell a lot of people back home, “You guys gotta just let that hatred go. Find what you can do with that hatred and goodness and help change the world, because your madness is making the world worse and worse.” I took my hatred and my madness and tried to change the world for good and give back only good things. And I’m seeing the fruit that is bearing. Paste : When you’re traveling, do you find that people respond differently from one place to another? Bradley: Everywhere I go, I get open arms. I don’t believe I’ve had a bad experience since I’ve been on the road, because I try to reserve myself after I do a concert. The guys in the band, they can go out and party have a good time, but I go to my room and I reserve myself. I want to build my vocals up again so I can give the next crowd a good show. That’s my motive. I want to give everybody a good show. It tears the body down, but I tell you what, I learned how to reserve and build it back up. That’s what I do. But you know, my mom used to say, while you are living in that physical body, that’s your chance to show your love to the world. Don’t reserve or wait till tomorrow because you won’t have it. If I have a chance to give my love to the world today, what are you saving it for? That’s why every show I try to make it like it’s my last show. A while ago I was over here in Europe and I had a fever of 105. I had a 45-minute show to do, and I said, “God, I can’t do this show.” I got to the place and the house was full. I said, “Charles, you can do this. It’s 45 minutes. You can do it. You always do an hour and 15 minutes, and this is just 45 minutes.” It was an outdoors show, and I looked as far as I could look and all I saw was heads. So I went out on stage and the crowd goes crazy. All of a sudden I’m burning up. It was 98 degrees in the sun. I said, “If this is the gift you’ve given me, Lord, give me strength to please these people.” And I did the show, but on the last number I felt myself seeing polka dots! I turned around and walked off the stage, and there was a doctor there saying he wanted to examine me. I said okay. They said they had to take me to the hospital, and I said I can’t do it. I have a show to do in Canada! But they said, “we gotta check you out. Your complexion is gray-purple. You look bad.” So they admitted me to the hospital, and by law they’re supposed to keep you there five days. But they said they’d let me out in two days if they could get my white blood cells to a good level. So they fed me antibiotics and fed me lots of fluids. The next day I felt good, but they had to keep me there to give me a better dose of antibiotics. Then they said, we’re not supposed to let you go, but you’re so determined to do your shows that we’re going to let you go. They gave me some medicine to take with me, and told me no alcohol. I said okay, no alcohol. The next show was sold out, and the next one after that was sold out. Seems like every time I go somewhere, it’s sold out. So I was glad I did it. It made people happy, and that’s what makes me happy. Paste : You have to respect that sense of responsibility. Bradley: People always ask me, “How do you keep going?” I always say it’s out of love of you. I see that an opportunity came to me in my late life. I had an opportunity to sing, and I thank you. Bradley: It is. But you know, when I go home, all those memories come back to me. I’m still in the area where my mom had a house when I was 11 years old. And I’m seeing so many bad things and good things happening there. I’m ready to leave it. I’m ready to get out of there. I’m ready to blossom myself and find a world that can make me forget about a lot of things that I want to forget about. Europe is the place that honestly put me on the map. I have so much love for Europe. I was fighting for every opportunity in the United States all my life. When I came to Europe and I did a show, they gave me a chance. Paste : Tell me about writing these songs. Are you writing them based on the instrumentals? Bradley: Some of the songs. Tom has a library with some instrumentals in it. Sometimes when I’m on tour, the band will start playing something and I’ll say, “I like that.” When I say that, everybody gets their recorders. They want to tape what I’m going to say. So Tom puts it in his library. Many months later, he says, “Charles, come over here. I got something I want you to hear.” Some I do like and some I don’t like. When I do like it, I say, “Whoa! What is that? Give me the mic.” When I say, give me the mic, you get your recorder. And that’s how things come up. Paste : Is that how “Change for the World” came about? Am I dreaming? Who is gonna protect us now? That is a meaningful statement. Because people are hiding behind religion. If you’re going to be religious, be honest inside and in your spirit. And know when you’re wrong. And that’s what I mean by that. Those lyrics came to me out of the hurt and pain and memories of things I’ve lived through. It just came natural out of me. Paste : This album sounds so perfectly timed for an election year. It sounds like something that is really needed right now. Bradley: It is. Yes. The U.S. is scary, especially with people running around with guns. They have no future, they don’t care. They’re pulling these guns on each other. I look over in the corner where I’m living at, there was this guy 17 years old shot a 13-year-old kid. The kid was outside playing and got the wrong bullet. So, if I don’t have no reason to be out, I stay in the house. If I have business reasons to go out and take care of business, I go out and take care of my business. But you can look at people’s faces and see the traces. You look at that anger in their faces. I’m one of the lucky ones, I guess. I just refused to sit still. There’s gotta be something out there for me, and I kept going after it. Watch Charles Bradley perform “I Might Just Do You In” at the Brooklyn Bowl in the player below.